Bad Blood BB0102K Spartan Plain Knife, G10 Handle, Sheath, BlackThe Spartan fixed blade from Hallmark's Bad Blood line is a Sean Kendrick designed knife with a custom feel. The handle is fitted with contoured G-10 scales and mosaic pins. The 8Cr14 stainless steel blade is satin finished and features a fine recurve profile. 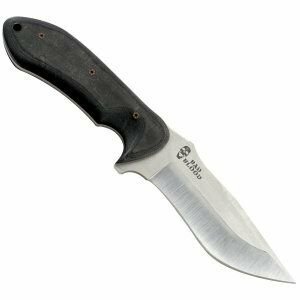 This Bad Blood knife comes complete with a fitted hard nylon sheath that includes a belt loop for carry.Bad Blood BB0102K Spartan Plain Knife, G10 Handle, Sheath, Black Features: Handle: Black, contoured G10 8cr14 stainless steel blade Fitted nylon fiber sheath Mosiaic pins HRC: 57-58Bad Blood BB0102K Spartan Plain Knife, G10 Handle, Sheath, Black Specifications: Overall length: 10" Blade Length: 4-3/4"
If you have any questions about this product by Bad Blood, contact us by completing and submitting the form below. If you are looking for a specif part number, please include it with your message.